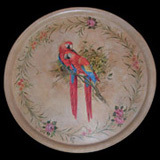 For use as a coffee table, or hung on the wall, there are many creative applications for our exclusively designed trays. Each tray is approximately 120 centimetres in diameter. Click on each photo for individual tray designs.